Aside from the irrational fear of encountering a dead body and the somewhat less irrational fear of being bitten by a fish or something, I literally jump in every chance I get to swim in a natural water body - be it a lake, a river, or the mighty ocean. 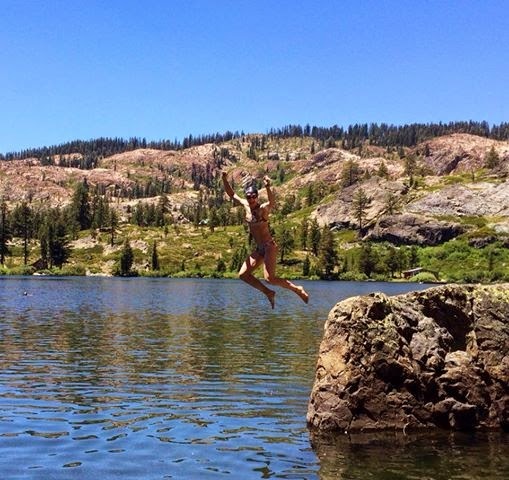 Last weekend spent in the high sierras provided ample opportunity to swim in and across multiple, pristine alpine lakes and rivers - Round Lake, Salmon Lake, Bear Lake and the Downie River, to be specific. It was over 90 degrees in the sun and so the chill of the water was welcome, if breathtaking, for the first few strokes. Siting on a lone pine, or a interesting rock formation I would quickly fall into a rhythm though, feeling the peace and solitude of the space, the wee bit adrenaline from the question - will I make it to the other side?, and the empowered feeling of moving my body through the water. I would finish 20 or so minutes later - goosepimpled and pumped - happy to embrace the cheering of my kids and to hand off the reins to my husband so he could have a go at it while I basked lizard-like on a rock. The rest of the weekend was filled with trail runs, SUPing, hiking, mountain biking (including the ever-awesome Downieville Downhill), and sitting down to long and delicious family style meals at the rustic and beautiful Gold Lake Lodge. Between adventures, the kids ran unencumbered with the other urchins who were spending the weekend at the lodge - catching butterflies, snakes, beetles, and a marmot (almost). The husband and I did near-seamless tradeoffs so that we each got our fix in before 9 AM, leaving the remainder of the day for family-orientated fun. Four days later we dragged ourselves off the mountain, did the long slog down Highway 80, and arrived home with six hours to spare before the grind of the real world began at 6 AM Monday morning. A friend's Facebook caption the other day said "Work Hard. Play Harder." Indeed.